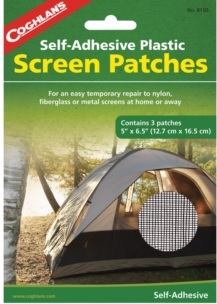 COGHLANS Self Adhesive Plastic Screen Patches are suitable to repair for nylon, metal or fiberglass screens. Easy to use pressure sensitive patch. Contain 3 patches 5” x 61/2” (12.7 x 16.5 cm) pieces.